Three hundred and fifty clergy and laity from around the world met at the Hilton in Fort Worth, Texas, on July 13-17, 2015, to attend the first International Catholic Congress of Anglicans (ICCA), entitled One Church, One Faith, One Lord. Primarily sponsored by Forward in Faith North America, and based on the Anglo-Catholic Congresses of the first half of the 20th Century, the Fort Worth event aimed to recall traditional Anglicans to a renewed sense of the catholic nature of the Church and her mission. “We look back to the previous Catholic Congresses not with nostalgia, but with a resolve to live out the implications of their prayers, with gratitude for their vision,” stated Forward in Faith North America’s President, Bishop Keith Ackerman. The international scope of the Congress was reflected in its speakers, who included Bishop Keith Ackerman, Bishop Michael Nazir-Ali, Archbishop Valentino Mokiwa, of Tanzania, Archbishop Stephen Than Myint Oo, of Myanmar, Bishop John Hind, retired Bishop of Chichester, and Bishop Ray Sutton, of the Reformed Episcopal Church’s Diocese of Mid-America. Breakout sessions focused on marriage, pro-life ministry, the challenge of Islam, catholic devotional societies, theological education, icons, SOMA missionary work, church planting, and more. Daily worship, consisting of Morning Prayer, Choral Evensong and the Mass, took place at St. Andrew’s, in downtown Fort Worth. Preachers included, Archbishop Foley Beach of the Anglican Church in North America (ACNA), retired ACNA Archbishop, Robert Duncan, Archbishop Mark Haverland of the Anglican Catholic Church, Bishop Fanuel Magangani of Northern Malawi, Bishop Paul Hewett of the Diocese of the Holy Cross, and Bishop Chad Jones of the Anglican Province of America. This sentiment was echoed by Congress organizers, who hope that a broad coalition of orthodox, catholic-minded Anglicans will emerge from the event. 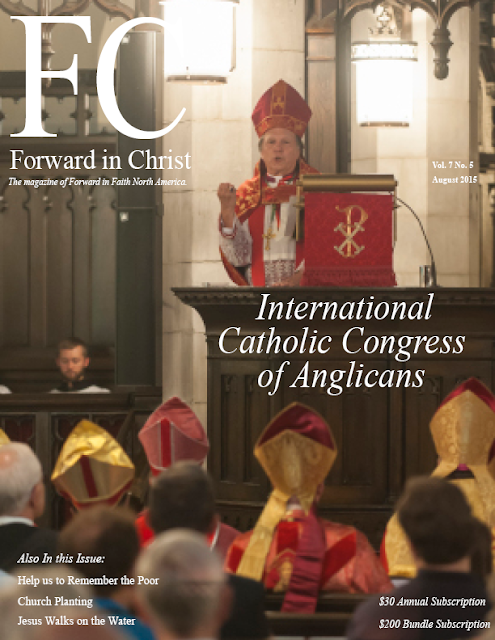 Forward in Faith North America, and its partners from the International Catholic Congress of Anglicans are committed to this vision of a renewed Anglican Church that is authentically One, Holy, Catholic and Apostolic. Bishop Keith Ackerman announced his retirement as President of Forward in Faith North America at the Congress on Wednesday, July 15. He is succeeded by Fr. Larry Bausch, Rector of Holy Trinity, Ocean Beach, CA (ACNA). Ackerman will continue serving Forward in Faith North America, with the title Ambassador for Anglican and Ecumenical Affairs.